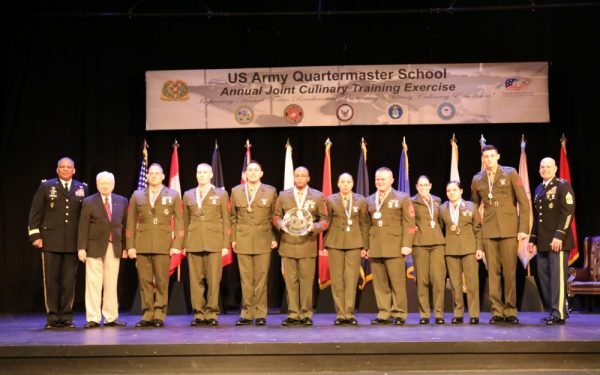 The Marine Corps for the first time has claimed top honors as the culinary team of the year at the Armed Forces Chef of the Year competition in Fort Lee, Va. 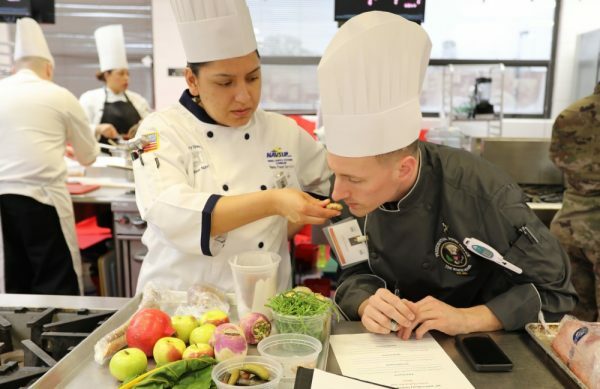 The American Culinary Federation awarded 293 medals March 15 at the conclusion of the two-week training event and competition at the Joint Culinary Center of Excellence, according to a statement from the center. Teams from the United States, France, Great Britain and Canada — more than 200 military chefs from 22 installations — took part in the Joint Culinary Training Exercise, which began March 8. It’s the largest event in North America sanctioned by the culinary federation, and has been held annually for the past 44 years. “The Joint Culinary Training Exercise is about improving readiness of our armed forces,” Joint Culinary Center of Excellence spokeswoman Daneta Johnson said in an email to Stars and Stripes. 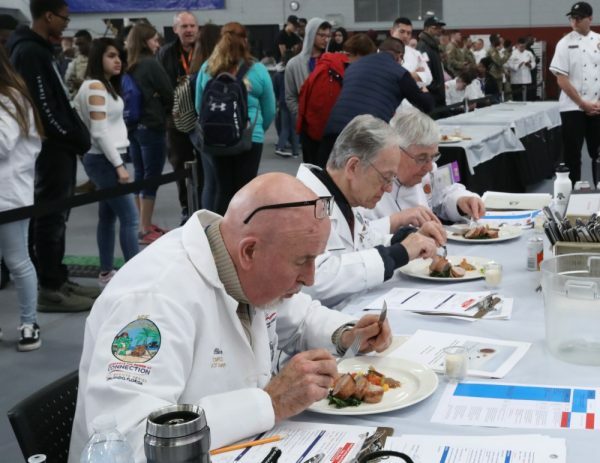 “The competing military members are able to hone their skills as culinary arts specialists and improve the quality of food services to their units, enabling them to better perform their duties at home and in a deployed environment. 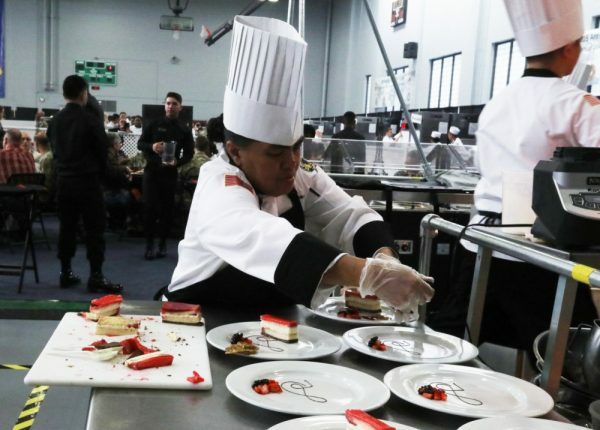 The teams competed for the title of armed forces chef of the year and in the International Two-Chef Culinary Challenge, in which 13 judges critiqued their culinary creations, she said. Mobile hot food kitchen: A five-person team cooks a four-course gourmet meal for 50 people utilizing military kitchen trailer equipment. Student teams: A five-person team, in which each member has less than two years of experience, creates a three-course meal. Table display: A team creates a cold food table with six mandatory dishes supporting a common theme to showcase a culinary work of art. Nutrition: A two-person team prepares a four-course meal where the caloric value doesn’t exceed 850 kilocalories and the balance is 15-20 percent protein, 45-60 percent carbohydrates, 25-30 percent fat. Student chef: An individual with less than two years of experience cooks a meal with a set protein. Armed forces chef: Individuals create a four-course meal from a mystery basket to be recognized as chef of the year. Pastry chef: An individual creates a hot/warm plated dessert and a live decoration of a celebration cake. Judges Award, Best in Show: Sgt. 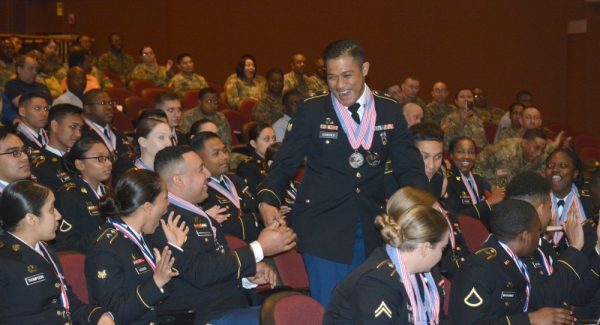 Bruce Serafica, Fort Carson, Colo.
Army Enlisted Aide of the Year: Staff Sgt. Justin Chase, U.S. Cyber Command, Fort Meade, Md. Student Team Competition: Fort Drum, N.Y.
Military Hot Food Kitchen: Fort Carson, Colo.
Nutritional Hot Food Challenge: Sgts. Klinton Bautista and Clarence Robinson, Joint Base Lewis-McChord, Wash.
Several winners will move on to compete at the American Culinary Federation National Convention and Show Aug. 4-8 in Orlando, Fla. Nine chefs earned spots on the U.S. Army Culinary Arts Team, which will compete at the Culinary Olympics in February in Stuttgart, Germany.